Microsoft introduced the ReadyBoost technology in Windows Vista with the promise of accelerated performance, but the claims fell flat for most users. However, this feature actually does work in Windows 7. You can use ReadyBoost in Windows 7 to speed up the boot process, data access, data processing, and shutdown. When a flash drive or card is connected with ReadyBoost, Your Windows 7 computer uses the flash drive’s memory as RAM. After all, RAM is what controls the systems speed. For Windows 7, Microsoft has also made two big improvements to the ReadyBoost feature. Although the 32-bit version of Windows 7, can only recognize 3.5 GB of system memory (RAM), you can add up to 256 GB of flash memory. You can also spread your ReadyBoost flash memory out over up to eight different devices. If you have a fast USB or flash drive available, give ReadyBoost a try with your Windows 7 system. Plug a fast key drive (a USB drive or Flash Memory drive) into a USB port. After a moment or two, Windows 7 brings up the AutoPlay dialog box. The faster the flash drive, the greater the memory boost. 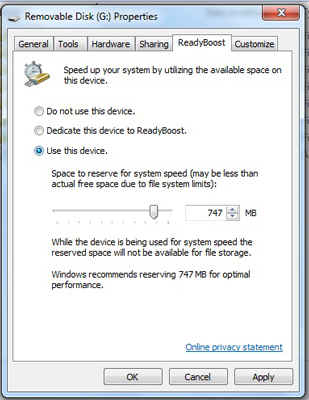 Windows 7 shows you the drive’s Properties dialog box, on the ReadyBoost tab. Whatever space is left on the drive can be used for your data files. You won’t need to use the Safely Remove Hardware feature to remove the key drive, but if you remove the drive, you lose the memory boost.